Show your American Flag some respect. 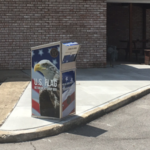 Our Flag Drop Boxes are made from high grade, heavy gauge, brushed Stainless Steel, guaranteeing the most durable and appealing flag drop on the market. We have been building stainless steel cabinetry for almost 40 years. We deliver high-quality, secure Flag Drops… direct to you. American Security Cabinets manufactures every Flag Drop at our production facility in St. Cloud, MN. Every Flag Drop is made with years of experience and care and customized to fit your needs. Communities appreciate the opportunity to dispose of their worn, torn or tattered American Flags in a respectful manner. A Flag Drop from American Security Cabinets can be installed at your local VFW, store, restaurant or any place you feel would work best for the community to easily access. At American Security Cabinets, we like to give our customers options. Choose a from a variety of design options for your Flag Drop. Do you need a finish other than Stainless Steel? There are many Powder Coat options to choose from as well. Our Brushed Stainless Steel Flag Drop Boxes are made up of over 65% recycled material and are delivered assembled and ready to install. Our Flag Drops require minimal maintenance and will last a lifetime. This leaves you with a low total cost of ownership, plus you OWN the box! American Security Cabinets warrants each Flag Drop against rust-through corrosion for as long as the original purchaser owns the Flag Drop, except for the following which are warranted for three years from the date of purchase: Flag Drop workmanship, accessories and color-coated items. 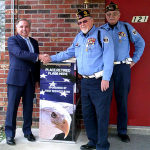 We are 100% satisfied with the purchase of our flag retirement drop box. 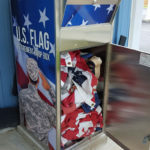 We have emptied the box many times and have properly retired hundreds of flags of all sizes since we installed the box. 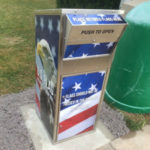 I have been contacted by a few organizations about the box after submitting a picture to the Ohio American Legion News. We also get regular comments from our community. The box is located in a convenient spot and is seen by everyone using the bank drive thru next door. We could not be more pleased with the purchase of this box. The box itself is better than we could have imagined. Local churches, businesses, and residents now make regular stops to our box to ensure a proper disposal of their flags. Virtually everyone who sees this cabinet for the first time comments very favorably about it. It is beautiful in appearance and functions extremely well. The slow closing deposit door is a great feature, showing respect for the flag just deposited. We had ten flags deposited within the first two weeks of its service. I am extremely happy with the way the boxes turned out, and am super impressed. I have made a huge impact on my community with your help. 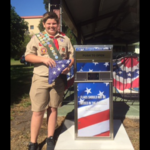 The drop box has been installed and already is filling with old flags. We are putting a notice in our city newsletter this coming month so I expect it will be used more since it is the only drop box in our area. We have received a lot of positive comments from our legion members, city administration and community members. We are very pleased with the drop box. I thought your customer service was exceptional and would highly recommend you to others. From the first appraisal I asked for, to the finished product of shipping, your support and guidance was very much appreciated. I am very proud of my son for accomplishing his project and the beneficiary of the box is very happy with it as well. Thank you for being so supportive! We are impressed with the construction and beauty of the box. We have received many compliments about it’s appearance and the wisdom of making such a purchase. It is doing very well, we average receiving about three flags per day. A huge increase over our previous experience. It is holding up well in the weather. We have had it about 2 and a half years now and it sill looks like new. It has been a good public relations move for the Post. We are beyond happy with our dropbox. 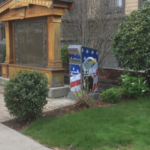 It has been installed in front of our Town Hall and the citizens of Saugus are constantly complementing it. It brings a sense of pride and patriotism to the front of the Town Hall! We can now feel confident that our flag will be safe before they’re taken to their ceremonial Friday. Your company was a pleasure to do business with.